Freycinet Marine Farm - a seafood lovers dream. 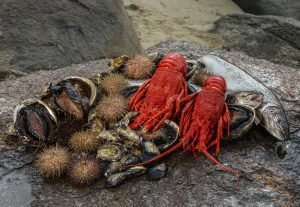 Local fresh seafood plucked straight from pristine Tasmanian waters. Oysters, mussels, rock lobster, Tasmanian abalone. It's the finest and freshest seafood you will ever taste. Kiss A Fish is the specialist seafood cooking school on the East Coast of Tasmania. Jetty Cafe - Delicious food with an emphasis on local produce. For the seafood lover, Tasmania’s is pretty much as good as it gets. Its clean seawater and fresh, inland streams offer up some of the best fish and seafood one could hope for—oysters, rock lobster, mussels, abalone, deep sea fish and mouthwatering freshwater trout. 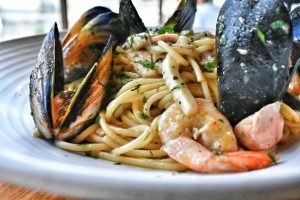 Dine on the fresh catch of the day at one of hundreds of critically acclaimed seafood restaurants throughout the island (Tasmanian mainland) and give your taste buds the vacation from the mundane they deserve. Image thanks to Tourism Tasmania & Nigel Honey. Tasmania has an abundance of award-winning restaurants serving up cuisine from all over the globe. Along with agriculture and forestry, seafood is among Australia’s most thriving industries. 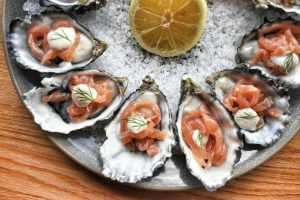 Deciding where to enjoy the mouthwatering seafare can be trickier than anticipated considering the city’s location along the Derwent River. 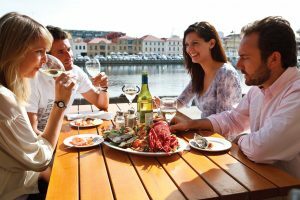 Dozens of restaurants highlight the best seafood Tasmania has to offer and are king in this region, consistently providing fresh and phenomenal signature dishes on their menus. 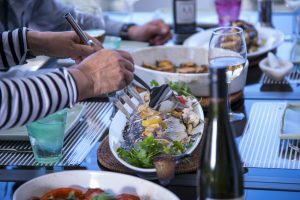 Fresh and delicious saltwater favourites such as salmon, lobster, oysters, sea urchins and abalone are plucked from the Tasman sea and served straight to your table. 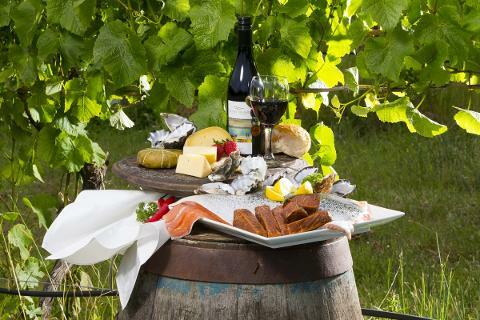 There are an almost overwhelming number of ways to consume Tassie seafood--from fine dining, fish and chips overlooking the coast, seafood tours with locals catching, cooking and serving dishes straight from the sea, purchasing freshly caught fish off your local fishmonger or at markets, oyster shacks where you can shuck your own oyster, or heck, if you’re into DIY, why not head out on a fishing trip and catch your own dinner (please respect local laws and ensure you have a recreational fishing license before doing this). 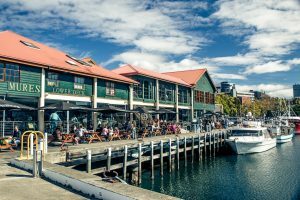 The best seafood can be found at Hobart Dock, and in coastal villages on the east coast, such as Bicheno, St. Helens, Strahan on the west coast, Launceston and the Tamar River. The Tasman sea is the meeting point for 3 different oceans, making it a hotbed for marine biodiversity. It has been reported to contain some of the world’s most unique marine life, with 90 percent of its species found nowhere else in the world. That is to say that different species coexist in this space when they should not. For example, sub-Atlantic species such as seals share the sea with warmer-temperature creatures like stingrays; this includes microscopic organisms such as plankton and large cephalopods like squid. Tasmania, as a result, attracts marine enthusiasts and water sports fanatics alike--as well as seafood lovers. Image thanks to Tourism Tasmania & Peter Aitchison. Two primary species of salmon can be found in the region, Eastern-Australian and Western-Australian. Although the two species are closely related, it’s the Eastern-Australian Salmon that carries the numbers. 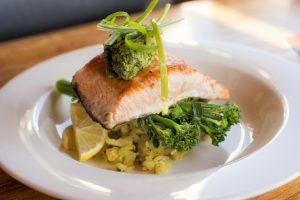 With the industry reaching close to 350 million dollars annually and waters that serve as a perfect breeding ground, salmon has become a true staple in Australian kitchens. Served raw (sashimi style), cold-smoked or baked right on the grill, salmon is a fluffy fish that is quite filling and easy to come by. Image thanks to Tourism Tasmania & Rob Burnett. Rock lobsters, locally referred to as crayfish, can be found in the waters around the south of Hobart. The main difference between a rock lobster and a regular lobster is the absence of pincers (or claws) on the first set of walking legs and the tail is used to carry eggs far more than swimming. The lobster is red and orange in colour with a yellow hue on the legs. 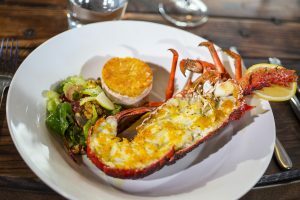 Imported from Tasmanian waters to be delivered around the world, a southern rock lobster is often the highlight of any seafood dining selection. As such, tough restrictions on the weight and length of rock lobster taken from the sea help keep the food favourite away from danger of extinction. Female lobsters carrying eggs must never be removed. Image thanks to Tourism Tasmania & Rob Burnett. The Pacific Oyster reigns supreme in these parts, leaning on geography, and cold water not frequented by humans, in order to breed. 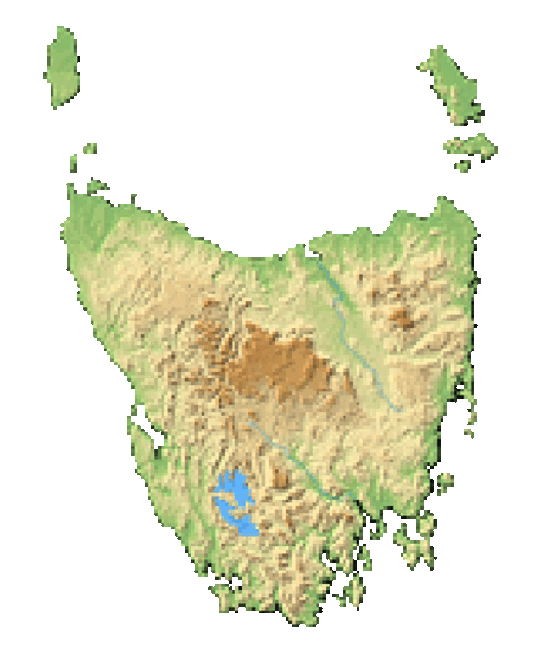 D’Entrecasteaux Channel, which is the crossing between Bruny Island and the southeastern points of the mainland of Tasmania, is an exemplary piece of geography to which Pacific Oysters can thrive. The sheltered peninsulas that are seeding with rich nutrients and assist with the unique biodiversity of the area only add to the ‘oyster wonderland’ effect. Smooth and creamy to the taste and so easily plucked from the sea, oyster shucking has become synonymous with Tasmania over the years; with fishermen hand selecting them from the rocky shores and consuming them on the spot, being naturally salted from the sea. With oyster farms dotting the northern, eastern and southeast coasts, some tourists even fish for oysters while they snorkel. 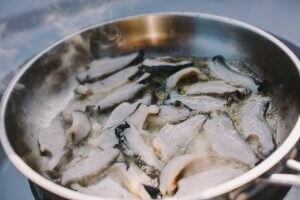 It is typical, however, that these scrumptious morsels of the sea are grilled over an open fire or sauteed in wine. Add some garnish and the table is set to dine. The same glorious conditions that make the areas around the Tasman sea ideal for Pacific Oysters to grow in such abundance, play out for abalone as well. 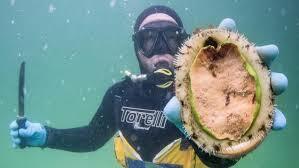 In fact, Tasmania has the largest wild abalone fishery in the world. 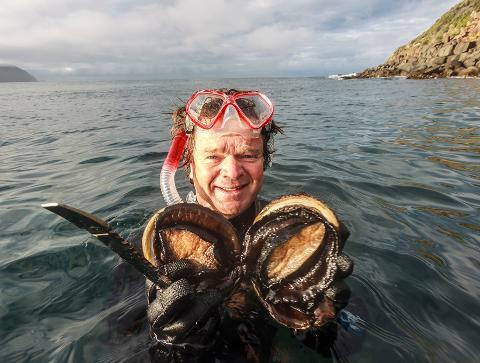 Fresh abalone (which are basically a large type of sea snail) have dozens of different species and can be harvested from the crisp waters around Bruny Island. More famous for their iridescent shell, which is used to design pieces of jewelry, abalone was not always a favourite amongst diners. The more difficult-to-capture, but also more delectable sea urchin usually took precedent. Day tours pass through the area often with skippers plunging into the sea to deliver the freshest of shellfish, but none more than abalone. Although the sea snail can be enjoyed raw, most prefer to flash fry the meaty flesh in browned butter to enhance its flavour. As a high-ticketed item, guests who wish to sample this meaty treat can expect to find it on the menus of fine-dining restaurants in Hobart. Image thanks to Tourism Australia & Ellenor Argyropoulos. Tasmania is known in the fishing world for its excellent coldwater ocean fishing. To access the best deep sea fishing areas, there are plenty of professional charter boat operators, particularly in St. Helens, the Tasman Peninsula, and near Hobart, that can take you to the hotspots. In these areas, it’s possible to catch large trophy fish like tuna, billfish and pelagic sharks. Tasmanian Blue Mussels are world-famous, and for good reason. These tasty molluscs are farmed with methods that have very little impact on the surrounding ecosystems, ensuring that generations to come will be able to enjoy them as much as Tassie visitors and locals do now! Many local mussel fisheries are certified as sustainable products by Friend Of The Sea. Nowadays, all Tasmanian blue mussels are farmed (as are they throughout the rest of Oz) in dense clumps at depths of around 5 to 20 metres. They’re collected on ropes and raised in long sock-like devices to protect them from being eaten, and harvested for 12-18 months, and are available for purchase and/or consumption in Tas year round. Trout season is big in Tasmania. Like, really big. Local fishermen wait for it all year, and when it finally hits...happy days! --with inland waters opening for angling from the start of August to end of April the following year. Of course, Tasmania’s landscape makes trout fishing ideal, with more than 3,000 rivers, lakes, streams and lagoons. Mount Field National Park is home to some of the region’s biggest trout population, with about 150 fish per 100-metres of wild river. Tasmanian trout produces moist, tender fillets that are delightful served in your favourite style of cooking. Image thanks to Tourism Tasmania and Rob Burnett. Tasmania contains some of the world’s most unique marine life, with 90 percent of its species found nowhere else in the world.